The New Hymnbook: The Saints Are Singing! Ardeth’s father became one of her greatest teachers. He was devoted to his children and found lessons in everything they did together. Putting up a fence became a lesson on eternal perspective. “Keep your eye on the horizon,” he’d say, “and don’t get too discouraged by looking just at the here and now.” A school bell’s certain ring became an admonition to be dependable and to listen to the reminder of an inner bell﻿—the conscience. One day when she was in her late teens, Ardie’s father asked her to stay home from a dance to fix dinner for the missionaries. Dances were the social event in town, and she was not particularly happy about missing one. But she obeyed. Elder Kapp felt the same way. “She had such an optimism and enthusiasm about her,” he recalls. “It just felt good being around her.” The impressions remained, and later, when he and Ardeth were both at Brigham Young University, they began dating. Because neither of them had much money, their dates were simple﻿—trips to a small ice-cream store where they ordered a malt and two straws, drives in the canyon, picnics, water fights in the creek, and long talks in a corner of the library. Through the years, they have continued their long talks﻿—precious moments of sharing and support, now held late at night. “We always wait up for each other,” Sister Kapp explains, “often catching a fifteen-minute nap during the day so we can stay awake.” Each speaks of the support he or she has received from the other, both in times of individual growth and in times of personal struggle. Ardeth and Heber interpreted this to mean that when their house was finished, Heber would be released. But when they were ready to build, the stake president, Stanford Smith, told them that there were no plans for Heber’s release, that the Lord had called him, and that they should see what the Lord had to say. “I remember feeling,” Sister Kapp says, “that I didn’t really want to ask the Lord, because I thought I knew what the answer would be. But we knew what we had to do, and we wanted to be obedient. So we prayed, and sold the property. This commitment to the Lord’s will has remained strong through the years and through a variety of callings﻿—speech director, Primary in-service leader, stake Relief Society board member, Young Women teacher, Young Adult Sunday School teacher, and now Young Women general president, to name just a few. Some of the Kapps’ challenges have been more difficult to face. “When I was growing up,” Sister Kapp says, “I envisioned living in a small white house with a picket fence. I thought I would just take care of the flowers, be active in the Church, friendly with my neighbors﻿—and have lots of children.” But as the years passed, no children came to their home, and their prayers about adoption were answered with a stupor of thought instead of the desired confirmation. She had to face the fact that the dream she cherished of raising children would not become a reality in this life. Answers did not come easily, but they did come, and with them came peace as she sought the Lord through prayer and through the power of the priesthood manifest in Heber’s blessings to her. The answers were the simple ones that are often so hard to find﻿—faith in the plan of salvation and in a loving Heavenly Father. Peace came in knowing that his promises are sure and that suffering is not in vain. “It’s the soul-rending experiences that bring us to God,” Sister Kapp comments. “Trials lead you into a diligent search; they make you ask questions that only the Lord can answer. You have to turn to him. And one day the peace comes that compensates for all the yearning. Both she and Heber felt it was important that they learn the lessons which come from being close to children﻿—serving when it is not convenient, loving when others are unlovable, being patient and tolerant. So she earned a bachelor’s degree in elementary education. Heber, too, taught school for many years. Now he works as a contractor, a direct result of his building their first home. Sister Kapp has also been guided as she has gone from an elementary school teacher to an instructor in BYU’s College of Education, and from a writer and instructor for the Utah Network of Instructional Television to a consultant for a time management corporation. 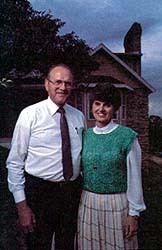 The Kapps outside their home in Bountiful, Utah﻿—another house built by Heber. Education and learning have always been important in Sister Kapp’s life. Several rooms in her present home (another she and Heber designed) are lined with shelves of books﻿—well-worn books with paper clips and underlining marking memorable passages. Her favorites include biographies﻿—Marie Curie, Golda Meir, and Winston Churchill, for example﻿—books on nature and management and, of course, the scriptures. “I’m not a scriptorian, although I’m better than I used to be. I just love to study the scriptures, looking for answers.” She has several sets of scriptures. Personal comments that fill the margins are indicative of her search for meaning. Now that Sharon is married, her children share in Ardeth’s love. “Mommy Ardie,” as sixteen-year-old niece Shelly used to call her, often spends hours sitting with Shelly in her room, listening to music and chatting. Shelly remembers one particularly enjoyable experience when, as a young girl, she accompanied Ardeth to Canada; Sister Kapp was going there to help her sister Shirley, who had just had a baby. “We had lunch and goodies to eat in the car, and we listened to a Winnie the Pooh tape at least a dozen times.” A favorite tradition is the shopping expedition Shelly and Sister Kapp take each summer before school starts, complete with a lunch of Reuben sandwiches. 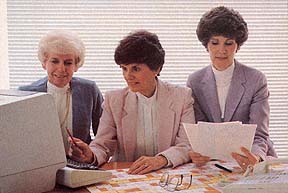 As president of the Church’s Young Women organization, Ardeth Kapp, along with her counselors Maurine J. Turley (left) and Patricia T. Holland (right), is responsible for over a quarter of a million young women. Young and old alike have discovered this love, this joy in life and faith in the gospel, and have come to Ardeth Kapp for help, comfort, or companionship. Her home is full of mementos﻿—samplers, quilts, ceramics﻿—given in appreciation for her infectious smiles and kind words. Ask those who have felt her influence﻿—from those who have read her personal writings to those who work with her in the Young Women organization. They will tell you that Ardeth Kapp has come close to realizing her ideal. Karen Thomas Arnesen, mother of one, is a French name extractor in the Salt Lake Winder West Stake. (Top) Five-year-old Ardeth at Waterton Park with her father and her brother Ray. (Bottom left) Ardeth and Heber Kapp break sod in July 1959 for their first home; they built the house together in the evenings and on Saturdays.